On the whole, I think most reviewers have been too dismissive of the Apple Pencil. There’s no question in my mind that the Apple Pencil is a boon to digital artists. The pinpoint accuracy and the incredible palm rejection make for the very best drawing device I’ve ever used on iOS, but I think the Pencil has a wider appeal than that. There are lots of pen-and-paper users out there, and I’ve actually spent a fair amount of time and money over the past year in an effort to become one. I acknowledge how silly that sounds, but digital has always been a more comfortable medium for note-taking than a paper notebook, at least as far as I’m concerned. Digital notes can be tagged, duplicated, and synced to any of my devices. I also type far faster than I can write. But there is no denying there’s a romantic aspect to writing with a real pen, even to a zero-and-one digital loyalist like myself. The scratchiness of a fountain pen on good paper, the sensation of posting a cap before you write, and the way the ink flows over the page — all of these sensations are satisfying in a similar way to typing on a great keyboard. There’s a lot to delight in when you’re writing with quality tools. This is where the Pencil comes in for me. With the introduction of this accessory, Apple has suddenly given Evernote, Paper, and their own Notes app far greater appeal. There are many instances where text notes don’t fully capture an idea, where a quick diagram would do far more to preserve a memory or train of thought. However, creating these diagrams with any degree of accuracy has always taken extra effort on the iPad. Keeping the palm off of the screen has always been of paramount importance, lest you accidentally activate a multitasking gesture, or leave weird marks on the page from where your palm was resting. All of the third-party stylii with palm rejection only worked about 50% of the time because they were at odds with multitasking gestures built right into iOS. Prior to the Pencil, writing and drawing on iPads always took a considerable degree of contortion to succeed in. Apple’s Pencil is noteworthy because it breaks all of the rules that other stylii had to abide by…and it just works. It has the power to turn metal and glass into something similar enough to paper. I don’t think it’s overdramatic to say that it sets the form factor free. 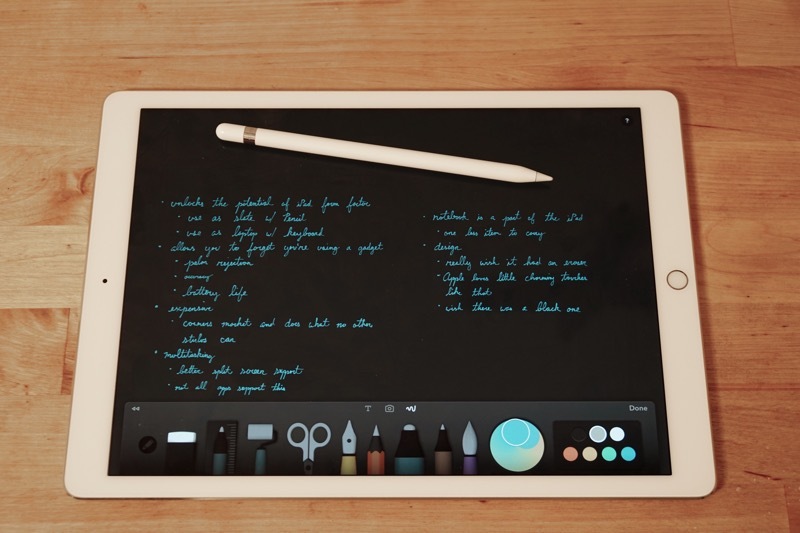 We’ve been able to use iPads as little writing laptops for a few years now, but the Pencil is what allows you to use an iPad like a blank sheet. You can rest your hand anywhere on the screen when you want to write, and drawing feels very natural, especially when you can physically rotate or tilt the entire canvas. This is something that no other iOS or OS X device can do as well, and it’s a a very powerful selling point for the iPad platform. In preparation for this article, I’ve spent a lot of time on the iPad Pro in a particular set of apps that have fine-tuned their experience with the Pencil.